Mr. Md. Saiful Islam, Register, Bangladesh Agricultural University (BAU) and Prof. Eng. A. K. M. Fazlul Hoque, Registrar, Daffodil International University (DIU) exchanging MoU documents in presence of Professor Dr. Md. Ali Akbar, Vice Chancellor, Bangladesh Agricultural University (BAU) and Dr. Md. Sabur Khan, Chairman, Board of Trustees, Daffodil International University. 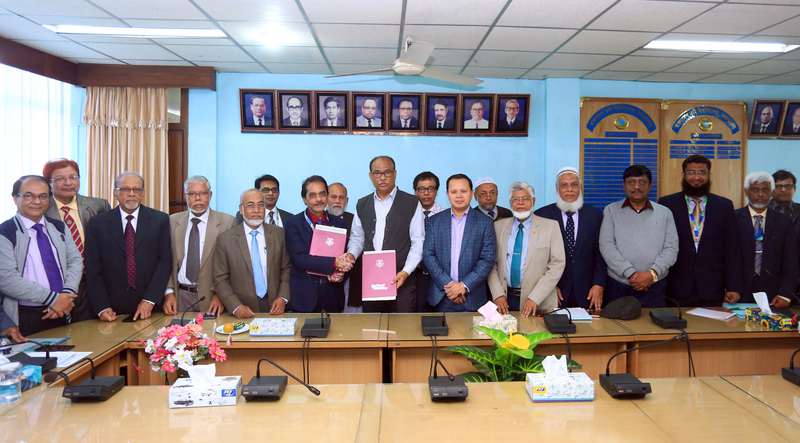 To strengthen, promote and develop academic and research co-operation between Bangladesh Agricultural University (BAU) and Daffodil International University (DIU), a Memorandum of Understanding (MoU) was signed on 11 February 2019 at the office of the Vice Chancellor of Bangladesh Agricultural University (BAU), BAU campus Mymensingh. Mr. Md. Saiful Islam, Register, Bangladesh Agricultural University (BAU) and Prof. Eng. A. K. M. Fazlul Hoque, Registrar, DAFFODIL International University (DIU) signed the MoU on behalf of their respective institute. Professor Dr. Md. Ali Akbar, Vice Chancellor, Bangladesh Agricultural University (BAU), Dr. Md. Sabur Khan, Chairman, Board of Trustees, Daffodil International University, Prof. Dr. M. A. Rahim, Director, BAU-GPC of Bangladesh Agriculture University, Professor Dr. S.M. Mahbub Ul Haque Majumder, Pro-Vice Chancellor, Professor Dr. Md. Fokhray Hossain, Director of International Affairs, Professor Dr. A. K. M. Fazlul Haque, Director, IQAC, Professor Dr Md. Bellal Hossain, Professor & Head, Department of Nutrition and Food Engineering, Dr. Amir Ahmed, Adjunct Faculty, Dr. Md. Rezaul Karim, Assistant Professor, Department of Nutrition and Food Engineering of DIU were also present in the MoU signing ceremony. According to the MoU, Daffodil International University and Bangladesh Agricultural University (BAU) will exchange their faculties, researchers, other research and administrative staffs and students for conducting collaborating research projects, Promoting agro based activities particularly with BAU-GPC, promoting academic cooperation, cross-Cultural education, lecture and organizing symposium as mutually agreed manner.